After an enjoyable summer in Ontario, herself and I returned to Lakeside in mid-October for our sixth Winter here. As always, we quickly got back into playing in the games run by the Lake Chapala Duplicate Bridge Club. They say that making a contract of 1 No Trump is one of the most difficult propositions in bridge. The rationale is that since the bidding has ceased at a very low level, the high card points are likely divided pretty evenly around the table, meaning that the outcome could go either way. With a friendly lie of the cards declarer could come home with overtricks; on a bad layout it could be a question of how many down the contract goes. 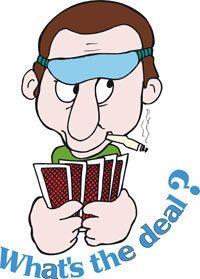 Of course, it also depends to a large degree on how the defenders play the cards they have been dealt. They also say that one should always lead partner’s suit – but just don’t tell that to Louise Morel and Catherine Gonzales who played the illustrated hand against herself and myself at the LCDBC recently. Herself opened the bidding 1 club and Catherine overcalled 1 heart. I now bid 1 no trump showing a balanced hand with about 8 to 10 high card points and, very importantly, at least one stopper in the opponent’s suit. This ended the auction and now the spotlight turned onto Louise sitting West to make the opening lead. Louise had listened to the auction and knew that her partner had at least 5 decent hearts and probably 9 + points. But she also knew I was prepared for a heart lead so she looked elsewhere for her opening salvo. The diamond suit stood out so without further ado she led the diamond king, the top of her sequence. When the dummy came down I could see lots of potential tricks; that is, of course, whenever I would get the opportunity to cash them. The diamond lead was unexpected – I fervently hoped that the suit was divided 4-3 or that the honors would block. But my hopes were dashed when Catherine correctly overtook her partner’s King and returned the 10. Louise persisted in attacking with her now established suit and all I could do was to pitch potential winners from the dummy and try to protect myself from going down. Eventually Louise ran out of her long suit and switched to the heart 4 which Catherine won with the ace. That was the end of the barrage by my opponents - I was now able to take 4 spade tricks, 2 clubs and 1 heart to make my contract but that was little consolation as the result was a tie for bottom board as almost every other declarer was making 2, 3 or even 4 no trump. Just imagine what probably happened at the other tables when West obediently led East’s bid suit. East would likely win the heart ace and, never dreaming of West’s actual diamond holding, continue the heart suit hoping to establish some tricks and use the diamond ace as an entry. Now the friendly layout of spades and clubs would allow declare to make oodles of overtricks. So kudos to Louise and Catherine for combining on a very effective defence. But may I ask the ladies: please restrict your brilliances to other tables in the future! BRIDGE BY THE LAKE By Ken Masson The Annual Valentine’s Sectional Bridge Tournament in Ajijic was once again a big success this February.